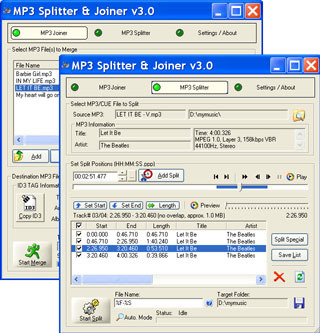 MP3 Splitter & Joiner is a useful MP3 audio editor which builds MP3 Splitter and MP3 Joiner in one. You can split, cut, trim a large MP3 into smaller pieces or join, merge multiple MP3 files to a larger one. Pre-listen / Preview split tracks with build-in MP3 player before performing MP3 splitting. With a slider bar, visually and quickly get to the position you want to split / cut the MP3 at. Edit and view MP3 ID3 TAG with build-in ID3 TAG editor. Merge and split MP3 files even over 1000 minutes or 1GB. Import/export track information of CUE files.